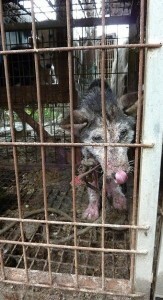 Home / Blog / Busan, South Korea, Shut down the illegal dog meat farms, slaughterhouses and markets. 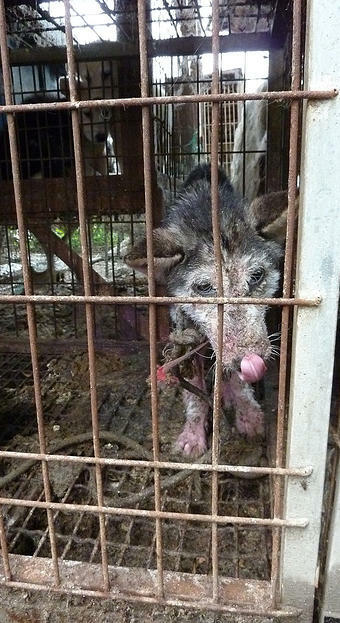 In Busan, there are countless dog farms, slaughterhouses, markets and restaurants where the dogs, who are tortured their entire lives, end up being slaughtered in the most inhumane ways, such as by electrocution, hanging or beating; and then thrown into boiling water – sometimes while they are still alive. In many places, dogs are being killed in full view of other terrified, caged dogs; and this takes place in broad daylight. In addition, many abandoned and stolen former pets end up in this industry, and are subjected to the same cruelty. The searches resulted in: 566 Health Food Shops; and 263 restaurants in and around Busan. Please sign petition, call, write and email the Busan Mayor and the City Council TODAY! International coverage of the brutal dog and cat meat trade in South Korea has stained your city’s image. The time to end this tragedy is now. An online petition calling for your immediate action to end the horrendous South Korean dog and cat meat cruelty is in progress: https://www.change.org/p/busan-south-korea-shut-down-the-illegal-dog-meat-farms-slaughterhouses-and-markets The favor of your reply is requested. Shame on any city or culture that indulges in these barbaric practices. YOU KOREANS PROMISED TO SHUT DOWN ALL THESE DOG SLAUGHTERERS & BAN THE EATING OF DOGS & CATS IN KOREA, YOU HAVE BROKEN THAT PROMISE, HOW CAN WE EVER TRUST YOU PEOPLE EVER AGAIN, YOU DONT CARE ABOUT ANY THING BUT YOUR EVIL SELVES, I WILL NEVER BUY OR HAVE ANY THING TO DO WITH KOREA EVER AGAIN, YOU ARE ALL EVIL BARBERIANS, IF YOU PROMISE TO SHUT DOWN ALL THESE DOG & CAT KILLERS YOU SHOULD DO IT, WE THE REST OF THE NORMAL WORLD HATE YOU PEOPLE FOR THE EVIL HORRIFIC CRUELTY YOU DO TO ANIMALS . Shame indeed! Where is President Moon? How long is this going to keep on? How depraved, deranged, unevolved and shameful it is for any country in the world to treat sentient animals. The governments of these heinous countries need to be absolutely ashamed of themselves in a 21st century civilised world. It is 2019, not medieval times, but South Korea, China, Philippines, Vietnam and other disgusting countries are still allowing this medieval torture on defenceless animals! UTTER SHAME ON YOU ALL!!!!! Please shut down this barbarian action! Cats and dogs are family!You don’t eat your family! Stop this nonsense….There are so many other things to eat….LEAVE DOGS AND CATS ALONE!!!!!! PLEASE, STOP THE ENDLESS BARBARIC SUFFERING FOR THESE INNOCENT CREATURES. IT’S HEARTBREAKING SEEING THE HORRIFIC LIVES THESE ANIMALS MUST ENDURE…. STOP this non-sense barbaric practice (torture and murder) towards the Innocent Dogs and Cats IMMEDIATELY, their Lives are Precious and no one has the right to mistreat them in any ways at all! STOP this non-sense barbaric practice (torture and murder) towards the Innocent Dogs and Cats IMMEDIATELY, their Lives are Precious and no one has the right to mistreat them in any ways at all! Demand JUSTICE for the Dogs and Cats in Busan and South Korea!! STOP STOP STOP this non-sense barbaric practice (torture and murder) towards the Innocent Dogs and Cats IMMEDIATELY, their Lives are Precious and no one has the right to mistreat them in any ways at all! This is wrong on so many levels. There is no place in our society for this despicable act of cruelty to any living creature. Stop this barbaric cruelty. Disgusting abuse of cats and dogs. Eating your pets and animals that help us in emergencies is bad enough, but the abuse and treatment they get before is horrendous and should not be happening in the 21st centuary. What kind of people do this despicable thing. Have you no soul?? ?Stop this now!!! It is truly despicable what you are doing to the dogs and cats. They are not meant for eating. They are like family and should be treated as such. They need to be respected and treated with kindness. I will not visit a country that condones this. This is barbaric and needs to be banned everywhere. Shut this slaughterhouse down now. This barbaric behaviour towards defenceless sentient companion animals has to stop. Dogs and cats are not here for us to eat. They give love and expect nothing in return, which is more than can be said of most humans. Do you really want to civilised world to look on you as barbaric, medieval and backward because of your inhuman and horrendous treatment of these animals? Stop this torture NOW.